A Maersk containership was seized Tuesday by Iranian forces as it travelled through the Strait of Hormuz in Iranian territorial waters, the U.S. Pentagon has confirmed. The ship has been identified as the Marshall Islands-flagged containership MV Maersk Tigris, which is managed by Rickmers Shipmanagement. Earlier reports that the ship was U.S. flagged and carrying 34 U.S. citizens have been discredited. According to Pentagon spokesman Col. Steve Warren, Iranian patrol vessels approached the Maersk Tigris Tuesday as it entered the Strait of Hormuz and ordered the cargo ship deeper into Iranian waters. When the Master declined, one of the patrol boats fired warning shots across the ships bow. At some point, the Maersk Tigris issued a distress call which was picked up by U.S. forces in the area. The U.S. Navy destroyer USS Farragut and an aircraft have been directed to the area to monitor the situation. 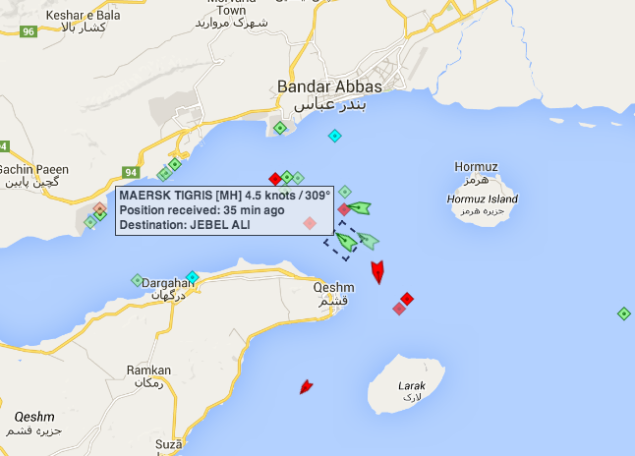 The MV Maersk Tigris was headed for Jebel Ali, UAE from Jeddah, Saudi Arabia when the incident occurred. AIS data shows the ship underway near the Iranian coast towards Bandar Abbas as of 10:51 a.m. EDT. “At approximately 0905 Zulu, April 28, M/V Maersk Tigris, a Marshall Islands-flagged cargo vessel, was approached by several Iranian IRGCN patrol vessels while in Iranian territorial waters transiting inbound in the Strait of Hormuz. The master was contacted and directed to proceed further into Iranian territorial waters. He declined and one of the IRGCN craft fired shots across the bridge of the Maersk Tigris. The master complied with the Iranian demand and proceeded into Iranian waters in the vicinity of Larak Island. The Iranian navy seized a ship on Tuesday at the request of Iran’s Ports and Maritime Organization, the English-language service of Iran’s semi-official Fars News Agency reported. “The ship is a trade vessel and has been seized by the Iranian navy,” said Fars, citing what it called an informed source. “The ship was seized after a relevant court order was issued for its confiscation,” the source was quoted as saying, referring to differences between the ports organisation and the vessel’s owner. It did not identify the owner. In a statement concerning the incident, Rickmers Shipmanagment, the company said it is “seriously concerned” about the safety of their crew and the incident. “The company would like to emphasize that it takes its responsibilities as an international shipping line very seriously complying with all applicable laws and regulations and ensuring that employees are aware of those laws relevant to their roles,” the statement said. “Rickmers Shipmanagement is liaising with the relevant international authorities, and their main priority at the moment is the wellbeing of its seafarers on board Maersk Tigris. The company continues to monitor the vessel’s position at the same time seeking communications with the crew,” the statement added. This entry was posted in ship models and tagged maersk lines, model boats, model ship. Bookmark the permalink.